Via the BBC comes this dispatch, from the BA Science Festival, of work by Eleanor Maguire and her colleagues in the Memory & Space Group at London’s Welcome Trust Centre for Neuroimaging. The research, first articulated in a paper, “Neural Substrates in Driving Behavior” (cited in Traffic), in the journal NeuroImage, details the many different regions of the brain that are activated during the act of driving by London taxi drivers (Maguire had famously noted, earlier, the plasticity of London taxi drivers’ brains — they seemed to have grown on the job). By observing taxi drivers as they ran simulated runs in the PS2 game The Getaway (which reproduces London’s topography) — it’s too cumbersome and expensive to equip a car with a neuro-imaging device) — Maguire and her team noted how different tasks (route planning, dealing with unexpected hazards, even thinking about their customers — and it would be interesting to see the full implications of this, as in what regions does a hostile exchange with a fellow driver engage?) 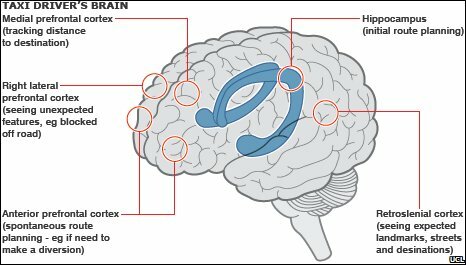 were associated with activity across different brain regions, as noted in the illustration above. Activity in the media prefrontal cortex even seemed to grow in intensity as drivers neared their routes, rather like an ETA indicator on a GPS. No word on which section of the brain is used in offering unsolicited political opinions to cab passengers. Comments Off on The Human GPS. Click here to leave a comment.